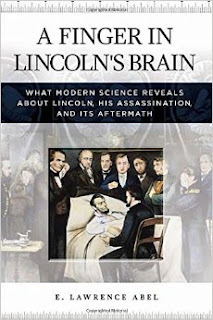 A Finger In Lincoln's Brain: What Modern Science Reveals About Lincoln, His Assassination, And Its Aftermath, E. Lawrence Abel, Praeger an imprint of ABC-CLIO, 270 pp., 18 b/w illustration, bibliographic end notes, bibliography, index, $48.00. CWL: E. Lawrence Abel brings his professional training in psychology and anatomy to a comprehensive examination of the Lincoln assassination. His arguments deal with the sciences of ballistics, disease, human behavior. Very well written in an accessible style. Myths and misunderstandings are explored and explained. Very likely to be the touchstone for all past and future considerations of the Lincoln assassination. From the Publisher: In this book, E. Lawrence Abel sheds much-needed light on the fascinating details surrounding the death of Abraham Lincoln, including John Wilkes Booth's illness that turned him into an assassin, the medical treatment the president is alleged to have received after he was shot, and the significance of his funeral for the American public. The author provides an in-depth analysis of the science behind the assassination, a discussion of the medical care Lincoln received at the time he was shot and the treatment he would have received if he were shot today, and the impact of his death on his contemporaries and the American public. The book examines Lincoln's fatalism and his unbridled ambition in terms of empirical psychological science rather than the fanciful psychoanalytical explanations that often characterize Lincoln psychohistories. The medical chapters challenge the long-standing description of Lincoln's last hours and examine the debate about whether Lincoln's doctors inadvertently doomed him. CWL: You suggest that Booth's shot was a 'lucky one.' With Booth so close to Lincoln, how could Booth have missed his target? ELA: Even at a distance of 5 feet, a derringer is inaccurate. I have just written an article for the Surratt Courier going into this in depth and I also cover it in detail in my talk at the archives (with illustrations). You can see it by googling: e. Lawrence Abel archives youtube. In short, the youtube shows that an expert aiming at a target five feet away, missed, and there is also a clip showing that the gun had a lot of recoil, causing it to jerk upward from the target. It was "lucky" in the sense that Booth was likely aiming at Lincoln's back (the larger target). CWL: Recently Dr. Charles Leale has been excoriated for his medical treatment of Lincoln? Do you agree? ELA: No, he did what he was trained to do. Although what he did would be sanctioned today, he shouldn't be blamed for making what in those days, wasn't a mistake. The ones who should be "excoriated" are the other doctors who also inserted their fingers into Lincoln's brain. It's as if they thought their fingers were better than Leale's. CWL: Recently, historians and psychologists have described Lincoln has being both emotionally depressed and fatalistic. You suggest that Lincoln may have dealt with these conditions by successfully managing his depression, fatalism and his ambition. How so? ELA: I don't suggest he did other than his fear of death [that] motivated him to do things that would result in a "symbolic immortality" such as becoming president, issuing the Emancipation Proclamation. CWL: What does a modern understanding of forensics make clear about Lincoln's wound? ELA: The fact that the wound was smooth and round means that Booth had to have shot Lincoln from Lincoln's right and not behind him. This is because Lincoln was leaning to his left when he was shot, and the only way to get a round smooth entry wound is if the gun is perpendicular to the target. If Booth were standing behind him, the entry wound would have been oblique and sharp edged. CWL: In what ways does your professional career bring clarity to the many myths of the assassination? ELA: Coming from a science background, I focused on issues that other historians largely ignored because they don't feel comfortable dealing with aspects of the assassination and individuals involved. CWL: How would you rate Samuel Mudd's medical treatment of John Wilkes Booth? CWL: Was the embalming of Lincoln's body a 'state of the art' in 1865 effort? ELA: Yes. Lincoln was embalmed using state of the art methods for that time. The deterioration in his body afterwards may have been due to the embalming fluid or poor perfusion. CWL: Describe your case for John Wilkes Booth not being a tool of the Confederate government. ELA: That would take a long time and I cover it in my book. Even if he were a "tool" that would not solely explain his attitude toward Lincoln, or his willingness to murder--there were other "tools" and others with the same deep seated hatred, and they didn't try to kill Lincoln. CWL: You make a persuasive case for John Wilkes Booth being very ill previous to the assassination. What symptoms do you see in Booth that suggests this? ELA: I have about ten pages of arguments that Booth was suffering from syphilis before the assassination, which was a spur of the moment act. CWL: Thank you for your work regarding Lincoln's assassination. When Pope Francis speaks outside Independence Hall in September, he will stand at the same lectern that President Abraham Lincoln used to deliver the Gettysburg Address. The Union League of Philadelphia said Friday it would offer the simple wooden stand for the pontiff to use during his planned speech on immigration and religious liberty. "Its simple beauty and humble role in one of American history's most important moments reflects, in many ways, Pope Francis' own world view," said Robert Ciaruffoli, president of the World Meeting of Families. The pope's visit to Philadelphia on Sept. 26 and 27 comes at the close of the World Meeting of Families, a triennial Catholic conference designed to strengthen family bonds. The pope will also celebrate a public Mass on the Benjamin Franklin Parkway. Lincoln used the lectern on Nov. 19, 1863, to dedicate part of the Civil War battlefield at Gettysburg as a cemetery. His two-minute address - beginning with "Four score and seven years ago" - became one of the most famous speeches in American history. It ended with Lincoln's resolution that "this nation, under God, shall have a new birth of freedom - and that government of the people, by the people, for the people, shall not perish from the earth." Lincoln, however, was not the featured speaker at the dedication. 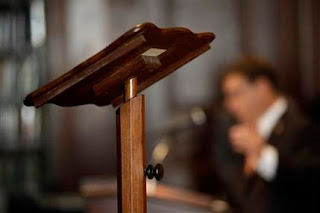 The wooden stand had been provided by a local professor to help the main orator, Edward Everett, manage extensive notes for a now largely forgotten two-hour speech, said Jim Mundy, director of education and programming for the Foundations of The Union League. The president followed Everett at the lectern. The stand is on a long-term loan from a private collector to The Union League, which was founded during the Civil War with the goal of preserving the Union. It has been on display at the league's stately building in downtown Philadelphia for the past two years. Conservators will soon begin working to stabilize the lectern for the pontiff's speech. Further details were not immediately available. Francis' appearance outside Independence Hall on Sept. 26 is expected to be a ticketed event. Exact arrangements have not been announced. The pontiff's first stops on his U.S. visit will be in Washington and New York.